Program Description: Bob is every one's favorite builder. 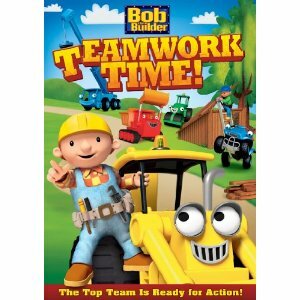 Together with his Can-Do Crew they are back for more adventures in construction and collaboration in Bob the Builder: Teamwork Time. Bob and his Machine Team work together while having fun. They demonstrate the power of positive-thinking, problem-solving, teamwork and follow-through to get the job done. Synopsis: Dizzy learns that being thoughtful is what can get the job done after she tries to prove she is a whiz at being helpful. Before a big performance Spud is missing. The show must go on, can Dizzy save the day? Roley learns that safety comes first when he tries to do a weather rap. Scrambler tries to build a tree house on his own, but soon finds it takes a team to get a project off the ground. Scratch learns that some problems are best solved by sharing. He has a solution and gets everyone to work together. The best plans start with teamwork. * "Bob and the Trampoline"
Bob the Builder and his crew of machines are always fun. Jayden just loves watching as they learn together. Jayden loves to identify the different machines and what they do. We loved watching the teamwork as they all came together in different ways. I really like the lessons learned within the entertainment of the show. I like all the activities on the site for kids to participate in. I love the videos and activities they have on their website. Both of my boys would love this dvd. My son loves Bob the builder! I love the Video's and games on the website! I like all the activities on the site. My little grandson would love this DVD. i learned there is a new bob the builder app for ipads, iphones, and ipod touches. wish there was one for android phones! my 2 year old son loves Bob the Builder, so this would be for him! I learned the website has games to play. I learned that Scratch The Small Digger sometimes gets scared and nervous because he's only a little digger. I like the fun activities on the site.